Just joined and I am looking for advice on where to find a replacement part for Ulmia front vise. 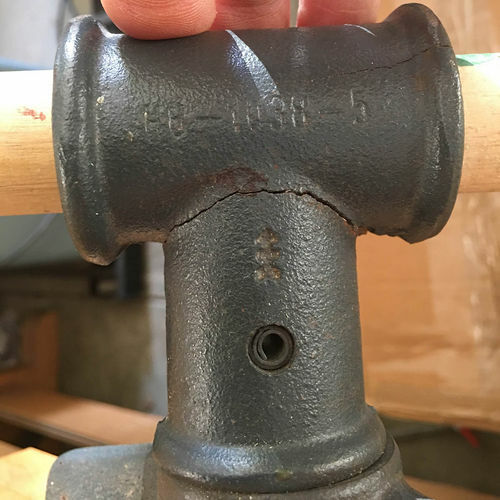 Unfortunately, while moving – the top was dropped and the front vise knuckle (?) was a casualty and therefore needs to be replaced. I do not want to buy whole vise – just a replacement part. I know I can remove the knuckle by removing the roll pin. 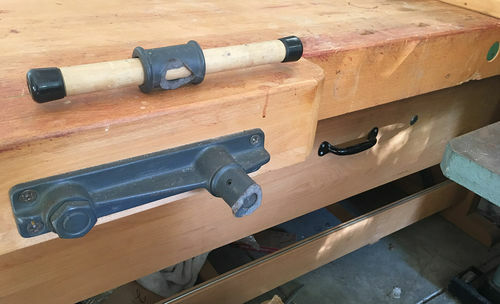 Appreciate any and all advice on where to get, name of the part as I would love to continue using the front vise and bench. Please contact me at [email protected] or click on the contact us link at the top of this page for more information. I have attached pictures of the vise and broken knuckle. punch out pin, remove wood handle then take to welder. if a steel fitting TIG weld it. if cast iron BRONZE weld it. as a high stress component it might last till you get a new one. most machine shops can make you a new one – but expensive if you want copied. However a simple machining ragther a copy could be quite cheap, one block of steel mounted in a lathe to drill / bore handle hole, remounted to drill / bore the shaft hole and drill press or lathe to drill the pin hole. you end up with a servicable square steel block instead of a fancier T shaped one.